A tribute to Sir Douglas Bader, the famed flying ace and war hero of the RAF, who flew his Hurricane to devastating effect during WW2 - the 4044 Hurricane has a raft of aviation detailing on the dial. Besides 40s era typography, the intriguing horizontal register day display adds a level of technical cockpit-inspired design. The “LE” markings as seen on Bader's Hawker Hurricane IIc are etched above the 6 o’clock index. A pumpkin-style crown mimics pilot watch design of the era. 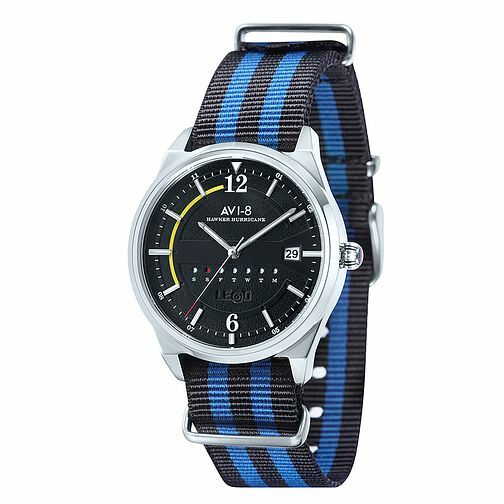 The robust, ribbon-like Nato strap nods to the ribbons as awards and tributes to the RAFs finest.